San Francisco, CaliforniaDr Toy speaks to the nature of good play and quality toys. Griddly has received numerous recognitions from Dr. Toy, including: 10 Best Games, Best Picks 2013, Best Vacation Product, 100 Best Children’s Products, and 10 Best Educational Products. Play With Purpose encourages students to improve their academic achievement by developing cognitive abilities and important life skills through play. Griddly Games was recognized in 2013 for it’s Outstanding Educational Value as a 2013 Creativity Winner and Cognitive Processing Speed Winner. Founded in July 1989 to provide the most comprehensive and responsible parenting advice to parents everywhere. 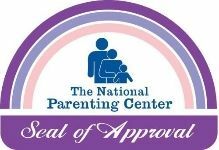 Recognized by the National Parenting Center’s Seal of Approval program in 2011, 2013 and 2016, Griddly Games has helped parents as they tackle the challenges and enjoy the many rewards of parenting through play. With departments such as Kids at Play, Health and Safety, Discovering Creativity, Nurturing Talent and Tomorrow’s Child – Investing for Your Child’s Future, Creative Child Magazine is the most complete parenting publication for raising well-balance children. Griddly Games has been recognized in 2014 and 2008 for Game of the Year.